Tirumala, the most visited religious site in the world is located in Andhra Pradesh state, just 4 hours from Chennai. I arrived at the train station at 5:30 AM for my 6:30 train. I boarded the train along with about 1,000 Indians and zero foreign tourists. The train ride took 3 1/2 hours and was very different from an American train. The seats in 2nd class were not comfortable and I was squeezed on a small bench with 2 other men and 1 baby. Random beggars walked down the aisle asking for money. Many of them were horribly disfigured and many of them grabbed me. This became a huge personal crisis since these beggars, in my opinion really needed the money but most likely wouldn’t receive any of the money that I would give them. If I give money to one, as a white person I will certainly get swarmed with nowhere to flee. Also, random salespeople who may or may not work for the railway walked down the aisles selling food and water. I bought a masala dosa, which is a savory Indian crepe. After arriving in Tirupati, the service town for Tirumala, I was once again greeted with the crowds, ignoring them, I walked through the town and eventually found a very nice hotel called the ASR Guesthouse. The staff was absolutely lovely and the prices were great ($15/night with free WiFi). I then got an early lunch. Tirupati is located at the bottom of a huge hill, while Tirumala is at the top. Its 12 km to the top. While many people take busses, there was a great footpath up to the top. Since it is a Hindu religious site, shoes are banned, but the temple authorities offer a free shoe transport to the top of the hill. Additionally, they give out free food/water and a shortcut in the line to anybody who walks. The guidebook said it takes 4-6 hours, but I was able to do it in 3, although it was certainly not easy. 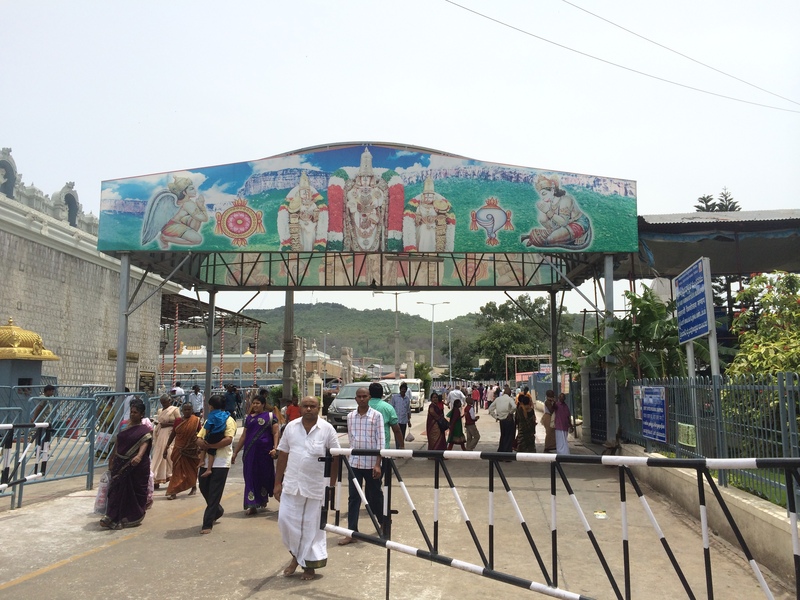 Tirumala was basically like a giant Hindu theme park complete with a large parking lot, tons of shops, and long lines. While there are other temples in the area, there is only 1 that people come to see. Most Hindu temples do not allow non-Hindus to enter, but Tirumala does..with a catch. The catch is that you have to sign a form declaring your faith to Lord Vishnu- basically another form. While I felt uneasy about this, I felt confident in my belief system so signing a piece of paper that nobody is going to see really won’t make or break my acceptance back home. They also required that I perform an “act of devotion” to Lord Vishnu. Since the god apparently likes hair, I decided to get my hair tonsured. After dropping off my shoes, bags, and phone at the security checkpoint, I entered the tonsure building. There were about 500 people locked in 3 separate cages. They put me into the middle cage and locked me in. There I waited for about 30 minutes before they unlocked the cage and pushed me into a line. At the front of the line, they gave me a razor and a sheet with a number. The number corresponded to a barber in the tonsure chamber. I gave him my number and razor. He laughed because he was shocked to see a foreigner here. I kneeled in front of him on the tiled floor. He first poured a bucket of water on my head before started shaving. As he shaved, I could see the hair falling onto the soaking wet floor in front of me. I didn’t cry, but was feeling very emotional. Finally, he signaled that he was done and I felt my head. It felt smooth. I then went back to the religious officer and he let me go to the temple. 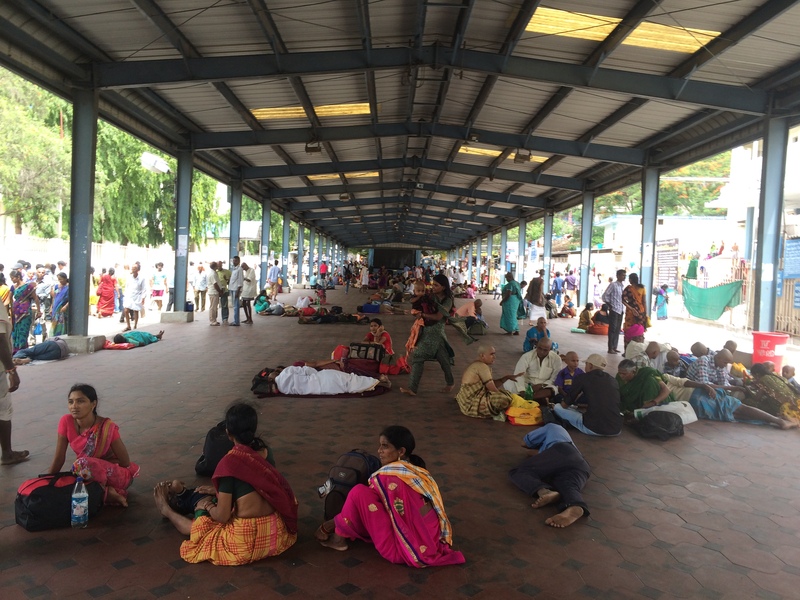 Hanging around Tirumala- there aren’t very many people here because everyone is in the line. I went into the special shortcut line that normally costs $5 but was free since I walked up the hill. This was by far the longest queue I have ever seen. 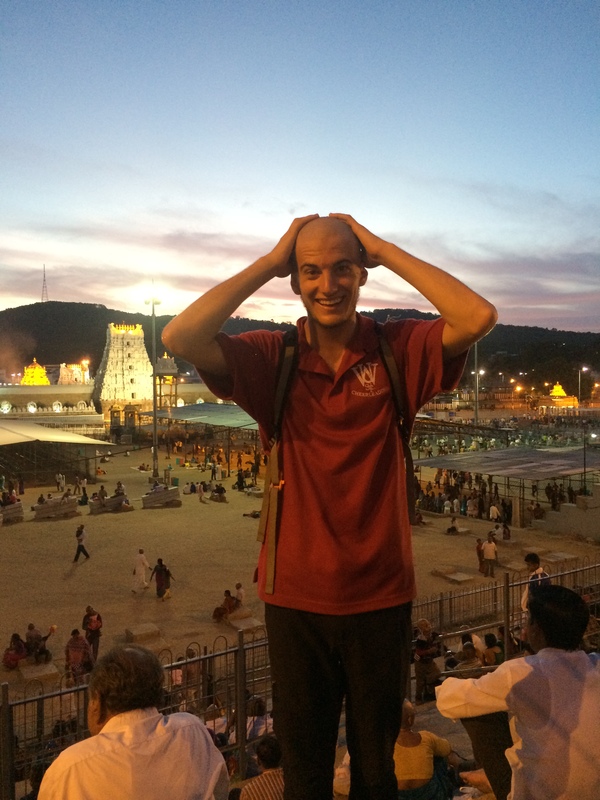 I walked for 30 minutes before getting to the start of the actual line- this is because Tirumala is the most visited relgious site in the world, attracting 100,000 people/day and 500,000 on festival days for a grand total of 40 million visitors/year. The temple employs 14,000 people and has an estimated worth of $500 billion (like 10 Bill Gates). After going through another metal detector and a check to make sure I had no cameras, they put me in another large cage and locked it. There were about 200 other people in a holding cage. The temple staff estimated that we would be locked in the cage for an hour. After the hour, they let us out into the line. Unlike lines in America, the line here was madness. People kept pushing to get just one person in front. Every open space was quickly filled by another body. People were so close together that would probably win the world record for world’s longest grind train. The line wandered past another 20 cages before winding another mile or so to the outside edge of the temple. There, we went through a 3rd metal detector before being snaked through the outer parts of the temple. Finally, we arrived at a golden entrance to the inner sanctum of the temple. Because there was only one doorway, they had to alternate between letting people in and out. Hindu chants were being played on loudspeakers. Once they started letting people in, the mass of people ran as fast as they could to get to the back edge of the crowd ahead. People started chanting at the top of their lungs. The crowd pushed its way into the golden temple in the center of the inner courtyard. There, we moved through the line to peer at the golden statue of Vishnu. The statue was made of pure gold and its eyes were covered so as not to burn the worshippers. After about 2 seconds in front of the statue, I was shoved away by the temple staff. While all the pilgrims were maniacal about pushing to see the statue, everybody was extremely calm and happy afterwards. I stuck around in the courtyard and had some nice conversations with the fellow pilgrims. The people here came from all over India for this experience and they were all glad to have shared it with me. After leaving the inner sanctum, the temple gave out these sweet chickpea/fruit balls called laddus. They were absolutely delicious. My day started at 4AM but I finished the darshan at 7pm just in time to see the sunset. 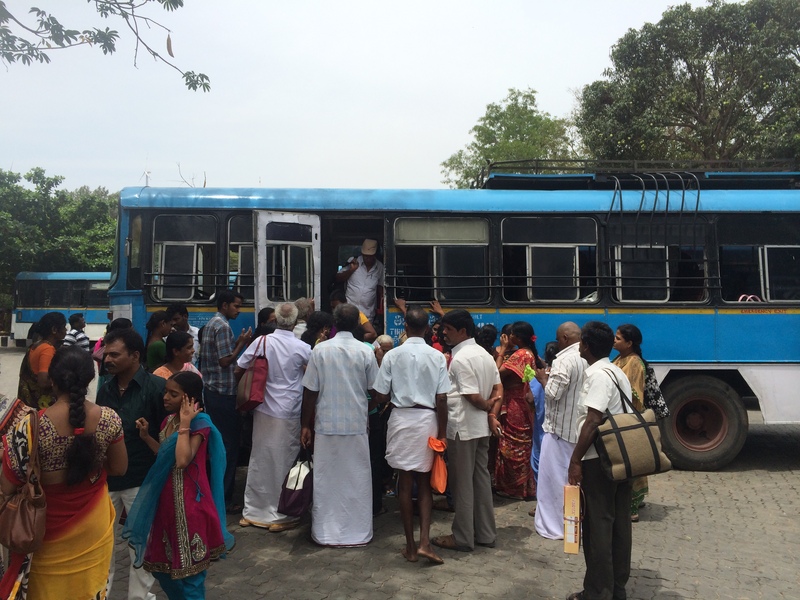 Since my feet were bloody, bruised, and dirty from hours of barefoot walking, I decided to take the bus down to Tirumala before going to bed. While the day was anything but comfortable, I saw an amazing side of humanity- the fervor and enthusiasm before darshan and the calm and joy after. They say the journey is the destination and it couldn’t have been more true today. Amazing experience that I can only imagine few foreigners do. You’ve discovered a truism about India, for every one there are thousands more …. of anything.